Our expertise and our state of the art diagnostic equipment ensure that you achieve the best hearing possible. We work with you over several weeks to tune your hearing device as your brain and your ears adapt to better hearing. Help others find us The Hearing & Balance Lab by reviewing your experience with us. 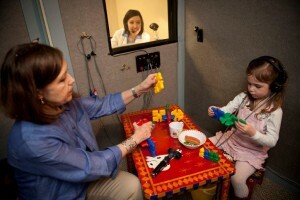 The doctors at The Hearing & Balance Lab use state of the art equipment to diagnose early childhood hearing issues and determine if a child’s hearing loss is a temporary or long term problem. 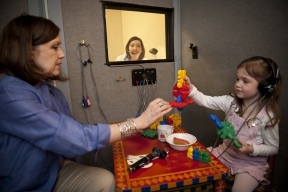 See Dr. Mallahan discuss infant hearing testing. Hearing loss is the number one birth defect for newborns. One per one thousand infants are born deaf and five per thousand have an educationally significant hearing loss. The good news is that all babies born in Snohomish County now get a hearing screening before they leave the hospital. Many of those that don’t pass the initial screening are referred to our office for further diagnostic testing to determine if the problem is a temporary or permanent loss. At the Hearing & Balance we utilize state of the art diagnostic tools to identify the degree and severity of the hearing problem. In partnership with the parents, we provide the primary care provider with guidance to provide solutions. Children identified with a significant hearing loss are now treated in a variety of ways to improve their communication opportunities. Surgical or medical treatment may be provided to solve the problem or lessen the severity of the loss. Many infants are fit with hearing aids or cochlear implants as soon as possible to provide sound stimulation to their brains.